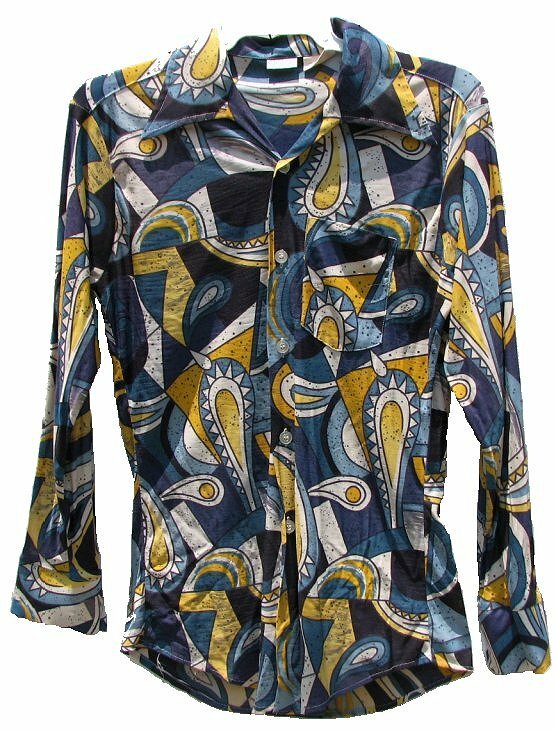 This authentic vintage 70s shirts has a wonderfully outrageous pattern. The former men's size Medium shirt fits like a today's men's size Small. The shirts is made out of a slinky type of 70s fabric consisting of 65% acetate and 35% nylon. The various colors in the shirt are midnight navy blue, cornflower blue, navy blue, dark teal blue, denim blue, cream and mustard yellow. The shirt would go well with bell bottom jeans. You will definitely stand out at a 1970s or Disco themed party wearing this. The will not comfortably fit a 34" chest. The sleeve length is just 31" and the shirt has a tapered cut.